"Fight Club Meets Night Club"
Strolling along Calgary’s 17th Ave and between 6th and 7th St, you may come across Rumble Boxing Studio. 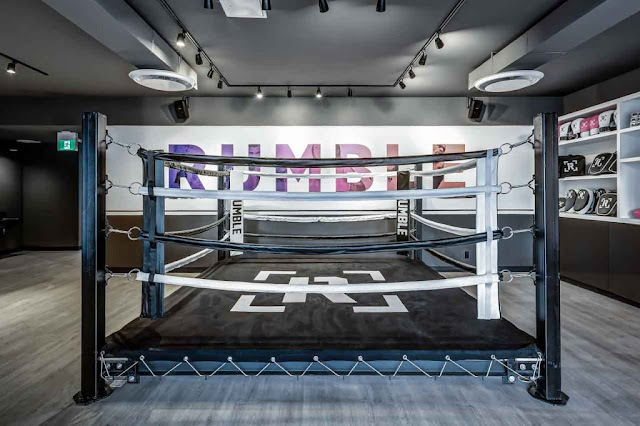 Launched in Nov ‘16, Rumble is one of the first boxing-inspired group fitness studios in Calgary. Don’t let their club beats and florescent lights fool you! Each class is designed ensure you get the best 1-hour work out with easy to follow routines so you don’t have to have any experience in boxing. Most importantly, they want you to challenge yourself and have a great time. In addition to group classes, you can also sign up for one-on-one training session with one of Rumble’s professional boxing trainers. I had the wonderful opportunity to be invited to join some of their classes, and sat down with Rumble’s owner Cissy Chen for an interview! How did you come about starting a boxing studio business? The boxing-fitness idea came about when I travelled to New York and LA. It’s quite popular there and I personally love the idea of mixing the intensity of boxing and the rhythm of music. I’d been going to spin classes regularly here in Calgary, and I thought if people can dance on a bike, they could also punch to a beat. I wanted to bring what I saw in New York ad LA to my fitness-loving Calgarians – It’s the first in this city and I know many people would find it refreshing. What is the concept and philosophy of Rumble Boxing? 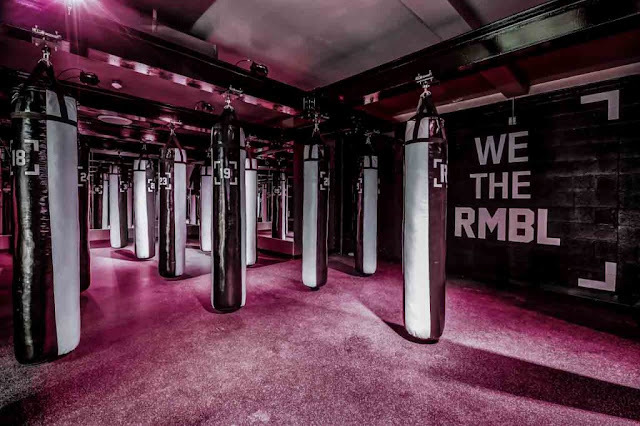 The concept Rumble is fight-club meets night-club, and our philosophy is through our classes, people are able to feel an increase in their physical and mental strengths while having fun. Describe the day-to-day activities that go on at Rumble? There is a lot going on at the studio everyday. We have people at the front shopping for fashionable athletic wear at the Rumble Boutique, and we have an Energy Bar that serves delicious fresh cold press juices and Acai Bowls prepared by Chef Shaun Desaulniers. Our main 40-boxing bags studio is where people pump. Upstairs is a private gym, which invites our members to work out. We try to keep the studio vibrant and full of positive energy. What is your favorite element in boxing fitness? Why do you think it’s becoming so popular worldwide? I consider boxing fitness is a therapy for me – It lets my mind to stay focus, and releases all my negative emotions and stress onto the bag, while I am building my strengths both physically and mentally. The workout is meant to be fun and not boring. I think there are many elements as to why this is becoming more and more popular: The social aspect to these classes where people feel engaged; Boxing has been proven to be one of the best body work outs; Boxing is kind of a badass sport and we all want to release our ‘inner beast’ sometimes; Many social media influencers have shown their fitness routines involve boxing. What is your word of advice for young entrepreneurs who want to start their business in Calgary? If you have a great idea, then just go for it. Sometimes we wait too long and things never happen. Any specials or any upcoming event at Rumble? In January we have something called the ‘buddy pass day’ – we are appreciating our current clients by offering them to bring a friend or buddy to work out together at Rumble, both of their classes are free. We also have the DJ Kav Night that allows people to experience the real ‘fight-club meets night-club’ vibe.